The Trevinitone TT15 is a top performer. Small, compact and lightweight, it’s a great amp for small venues (or larger ones mic’d and run through the PA) and recording. It’s a fairly bright, clean 15w amp with a wide range of tone available. It’ll take pedals very well and the TT11 overdrive is a perfect companion if you want a bit more grind. Very dynamic and sensitive to picking, this is very definitely a “players” amp. Roll the volume back on the instrument to clean it up and turn full up for a classic EL84 growl. For recording, extra attention has been paid to the circuit design. In common with all of the Trevinitone amps, this one uses high quality components, with Vishay filter caps and Mallory 150s for the signal path. It also has Mallory 150s filtering the solid state rectifier and ground bus to cut down on noise. It comes supplied with JJ 12ax7s for the pre amp and phase inverter and a pair of el84s for the power amp. 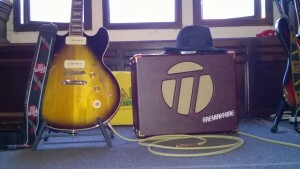 All wrapped up in a neat 1940s style 1×10 cab and finished with either chrome or gold hardware. Don’t be fooled by it’s lack of size, it can make itself heard and very definitely makes an impression.